26 short Bible discussions for parents to do with children aged 7-14. All it takes is a few minutes to take a short step forward. 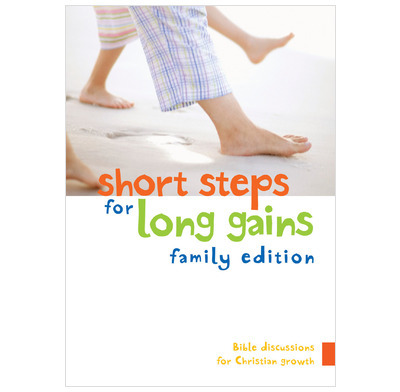 This clever little booklet follows the success of the original Short Steps for Long Gains, with Bible studies that the whole family can discuss. Written by Simon and Kathy Manchester, it has 26 short Bible studies (starting with A for Assurance and finishing with Z for zeal), with a quote from a Bible verse, and seven questions to spark discussion. It’s the kind of thing you could do once a week over a meal, as well as being eminently suited for youth ministry and Sunday school. Designed for 7-14 year olds, each study is brief, and by no means covers everything you could say on the topic. But sometimes, short steps, even for little feet, are the best way to make long gains. A Bible verse and related questions are neatly laid out, one topic to a page. We use this book as a guide for a fellowship group of 6. It keeps us focused and moves the session along in the right direction. I would recommend it. This book has/is been used for bible study at our "Christians at Work" group twice. Firstly not long after we started to meet and secondly still (using it) we started again 6 months after an alpha course having had new members join us. I am also using it as study material for a home small group that I lead consisting of 5 people with varying backgrounds and stages in their Christian life. The book consist of 26 studies each based on a short passage with short to-the-point questions. They are arranged from A-Z by subject title and cover many aspects of Christian life. The studies always initiate good discussion and the depth at which one can discuss the subjects and questions depends on the people in the group. You don't have to be of high intellect to use the book but it still can be of use if you are. This means it is very flexible and can be adapted for almost any group. The questions, though short, can often be searching and challenging. The studies take up to 1 hour but usually much less and leave plenty of time at the end for prayer. This book encourages small but steady steps forward in the Christian Faith. I have been a part of various bible study groups for nearly 20 years yet I am often challenged and encouraged by the studies. I heard the author speaking at the Keswick Convention last year and found him to be of sound doctrine and an excellent preacher with a down-to-earth approach. I am finding it hard to say anything negative about this book.